For a total of 2,500,000 AIR Tokens, 25,000 AIR Tokens will be distributed to each participant for the first 100 participants that have purchased AIR Tokens during our 2nd round Token Sale. Participants that have purchased a minimum of 250,000 AIR Tokens. From the start of the 2nd round Token Sale, (2019–04–04) till the successful completion of the Token Sale round, or the finishing date. Within 7 days from the finishing date of the 2nd round Token Sale. 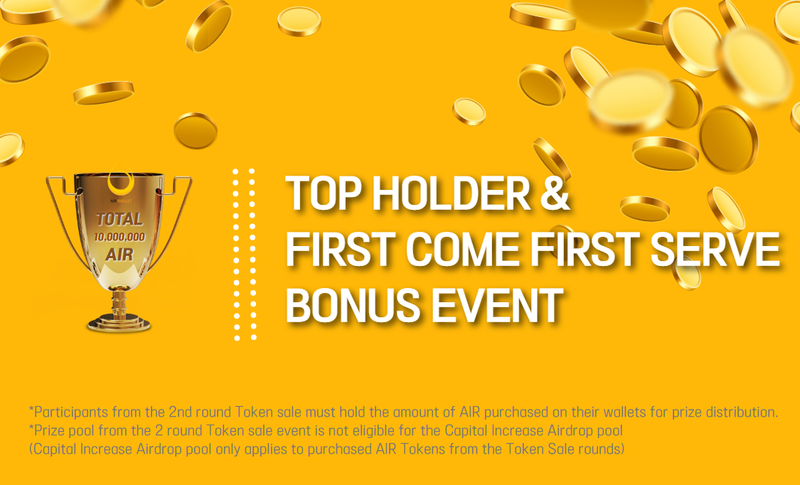 Participants from the 2nd round Token Sale must hold the amount of AIR purchased on their wallets for prize distribution.